Anyone can benefit from the high fidelity stereo recording that comes with the MV88. Plug it right into any iOS device equipped with a Lightning® connector and capture sound like never before. The all-metal construction has a hinged, rotating design perfect for multiple recording angles. The MV88 has 5 preset recording modes and includes a carrying case, windscreen, and headphone adapter cable. 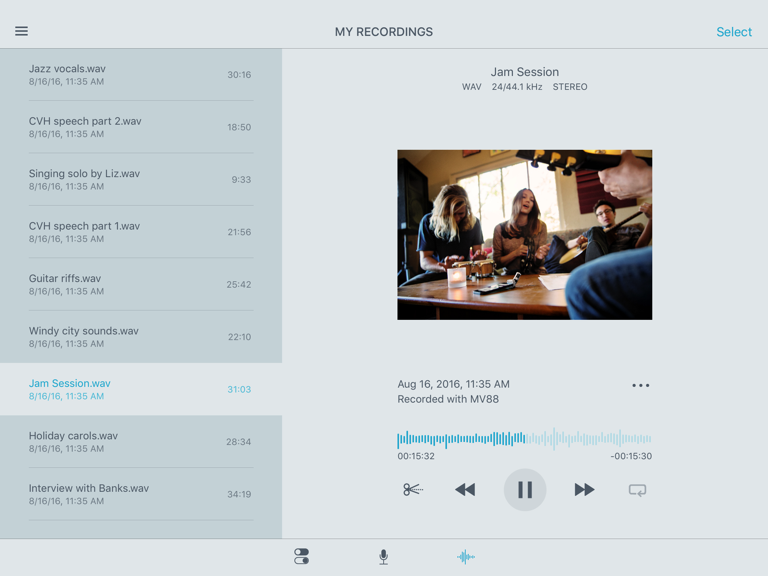 Use the free ShurePlus MOTIV app to record and control every aspect of the MV88, including advanced features and file sharing. Life's moments aren't just about the view. Document and share them with the MV88. Because great sound matters. The Shure MOTIV MV88 Digital Stereo Condenser Microphone directly connects to your iPhone, iPad, or iPod equipped with a Lightning connector to capture clean, clear stereo sound on the go. The mid-side microphone element is mounted to a unique 90-degree hinge with built-in rotation that allows for highly flexible microphone position, even in video applications. 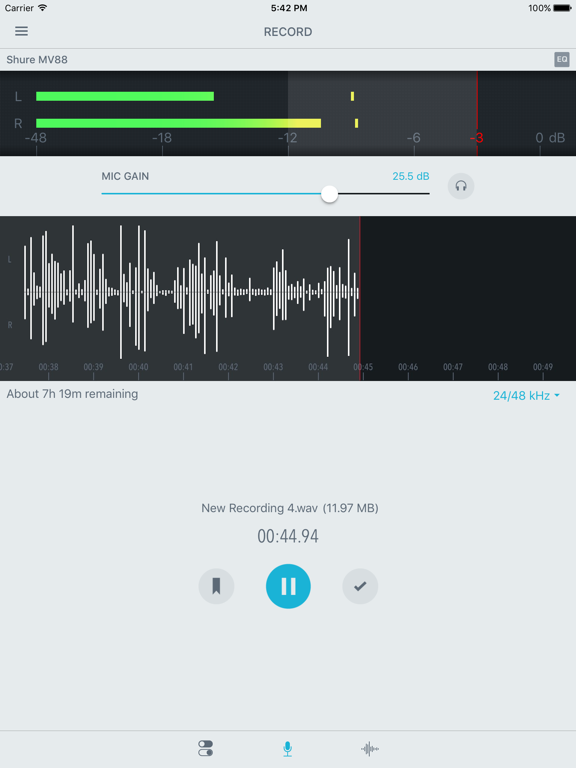 Integrates seamlessly while shooting audio for video on iPhone and iPad or when recording audio with GarageBand and other third-party recording apps. 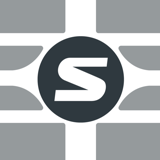 Access five built-in DSP preset modes (Speech, Singing, Flat, Acoustic Instrument, Loud) via the free ShurePlus MOTIV Recording App. 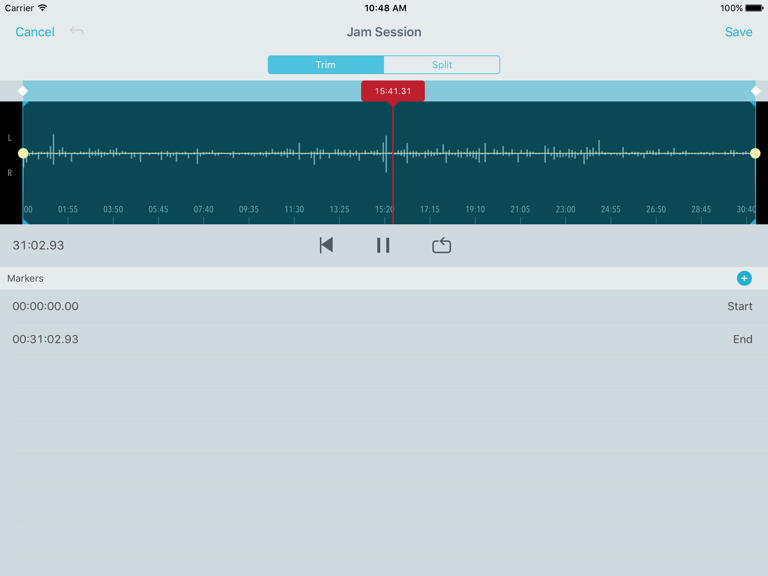 The app also lets you make real-time adjustments, including microphone gain, stereo width, and high-quality 24-bit/48 kHz recording for optimal results in virtually any environment. Shure-tested, all-metal construction provides confident performance anywhere. I have heard Iphone X, Filmic Pro & Sure MV88 are not compatible. Any solutions b4 I upgrade? I am currently using a 6s w/ Filmic Pro & external mic. The MV88 is not compatible with my iPhone 8 using Filmic Pro. I actually found this question while s The MV88 is not compatible with my iPhone 8 using Filmic Pro. I actually found this question while searching if anyone else had this problem. I have the Rode Mini and it works fine when I plug it in with a TRRS adapter. But the MV88 does not work when I plug it into the lightning port and I run Filmic Pro. It works with the regular iPhone camera video, but not Filmic Pro. Filmic Pro recognizes the device-- I looked under the audio tab in settings and it says that the Shure MV88 is attached....but it doesn't record any sound at all. If anyone knows a workaround I'd love to hear about it. Will this product work with iPhone 8 plus with iOS 12 or higher? I haven’t had any issues. If I have the MV88 plugged in - will it get used automatically when I take some video ? Or does the built-in mic get used. Im using Ipad Mini4. Yes, as long as the free Shure MOTIV app is installed. I've used it with iOS Camera app and Filmic P Yes, as long as the free Shure MOTIV app is installed. I've used it with iOS Camera app and Filmic Pro. An LED on the base lights when the MV88 is recognized. Haven't tried with other apps.